A sensitivity hiearchy of concern? > The following post is a revised and edited version of my responses to a comment conversation thread on Allan Bevere’s blog from his original post titled: “If a Mosque were Coming to My Neighborhood.” In those comments, I attempted to share some of my thoughts on how Christians should respond to the Mosque project near Ground Zero, or any other proposed mosque in our local communities. So that those comments makes sense here, I am posting them as my answers to a series of questions. How might Jesus respond to this debate? What biblical passages might lend insight? Perhaps one biblical analogy might be Jesus’ treatment/response to the Samaritans – an Abrahamic religion closely related to Judaism… (albeit a much closer relation than Islam is to Christianity) – though the analogy feels closer when one looks at the way Jews reviled and shunned them. Jesus encounter with the Samaritan woman and her village (John 4) was certainly not “sensitive” to the perspective/feelings of his own disciples and fellow Jews. The other thing that brings Samaritans to mind was the popular sentiment towards them at the time – many thought they were both idolaters (religiously speaking) and traitors (ethnically and nationally). Is this issue about rights? Politics? Faith? All of the above? Such pigeon holing is unhelpful at best, and deceitful at worst. Let me suggest that faithful Christians might not want to oppose this mosque for reasons that have absolutely nothing to do with being “left, tolerant, or open-minded.” And just to be clear, I am not sure I would call my position “support” for it either – but I am primarily concerned about Christians presenting a divided and anti-Christian witness and participating (however well intentioned) in deceit. One blog commenter has asked whether or not Christians should take the opposition to this mosque from so many people seriously. More specifically, his question was: “Should Christians not at least try to be sensitive to the feelings of so many people victimized by tragedy and subsequently opposed to this proposed mosque?” My answer? Yes. But what if that opposition (though much of it comes from shared pain and suffering from a horrible tragedy) were too closely aligned with deceit and insensitivity to some victims and their families of 9/11 in favor of other victims? How might we (Christians) perpetuate falsehood and suffering by ignoring the 58 law-abiding Muslims who died in 9/11 and their grieving families? Should we distinguish victim from victim and create a “sensitivity” hierarchy of concern? Or should we carefully and lovingly weep with all the victims and try to gently clarify falsehoods while trying to be sensitive to all who have suffered? (falsehoods like: Muslims=terrorists or Mosques=terrorist training grounds, etc). According to Scripture, shouldn’t Christians oppose false prophets and teachings that challenge their faith? Is the mosque truly a challenge to my faith in Jesus Christ? I am not so persuaded. Might virulent Christian opposition to it hinder non-Christians (and even Muslims) from coming to a saving faith in Jesus Christ because of how they see and experience professing believers behavior towards others? I think it would be hard to argue otherwise. Was Muhammad a false prophet according to biblical standards? Debatable. Not because I want to argue for some type of pluralism or equality of religious perspective and belief (far from it) – but because most NT examples of false prophecy had much more to do with internal Christian heresies rather than other religions or people of other faith communities (i.e. gnosticism was a distorted and heretical teaching in NT churches, not in Greek temples, etc.). At any rate, Jesus had much more harsh things to say to religious insiders than he had to say against outsiders. 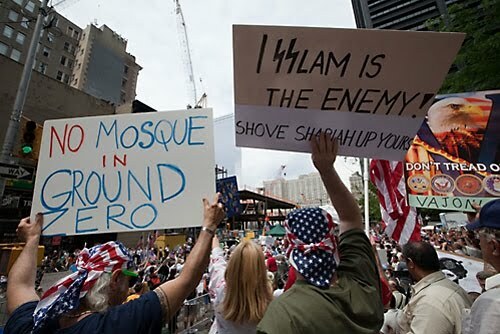 Should Muslim leaders continue to advocate for the mosque in light of all this? I am not sure, but I think that is an internal decision for Muslims to make. As an outsider I can see both sides – to move it seems to capitulate to the perception that Islam=terror. To continue forward with the project might led to the same. Either way, mosques all over the nation are experiencing similar opposition – maybe because of this controversy and maybe regardless of it – and either way, I believe Christians have an obligation to respond not with political correctness, but with cross-bearing love and truth.